Microsoft is bringing its widely adopted Live@edu collaboration suite to Moodle, the open source learning management system (LMS) that's installed at more than 35,000 registered, validated sites worldwide. Microsoft also unveiled today its new Education Labs site, which will serve as a repository for education software developed on an accelerated cycle. Through a new plugin developed by Microsoft and released today, Moodle users will be able to take direct advantage of Live@edu features, including calendaring, search, e-mail, shared workspaces, storage, and instant messaging. 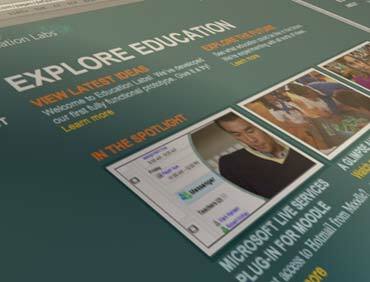 Live@edu is Microsoft's free portal, communications, and collaboration suite for education. The cross-platform service provides a range of hosted solutions for education institutions, including mail (with 10 GB per user), Windows Live SkyDrive storage (25 GB), and Office Live Workspace collaboration and document sharing, among others. According to Microsoft, it's now in use by more than 9 million students worldwide. According to Golden, the choice to bring this interoperability to Moodle, as opposed to other learning management systems, was based on Moodle's widespread adoption, flexibility, and openness. With more than 24 million users participating in more than 2.2 million courses, Moodle is generally recognized as the most popular learning management system on the market, open source or otherwise. It supports both small and large deployments (with several sites well beyond 100,000 users) and includes course management tools, various Web 2.0 technologies, online assessments, and other features common to learning management systems. "... [T]he utilization of a well distributed learning management system like Moodle becomes a really great leverage point for schools and a great marriage for us. So we think that putting them together and recognizing the thousands of institutions around the world--the 86 countries for Live@edu and the 207 countries that are touched by Moodle--becomes a really good combination," Golden said. "I think what we've tried to do is embrace what Moodle represents.... It's an open source course management system, and we love the fact that we're working in a collaborative way with that. And I think we also recognize that we have on our plate a whole pipeline of connectivity and integration that we have to be attentive to going forward." Golden added that collaboration with open source developers is an important part of Microsoft's strategy going forward, along with addressing interoperability and international standards. "I think we have a strong commitment to work with open source and with all the education communities," he said. "We do a lot of work with partners, and we recognize that we need to integrate a lot of different technologies, a lot of systems, a lot of standards. So we've always been very active on interoperability; we've always been active on national/international standards; and now we're excited to be active and working with different types of communities of developers, including the open source community." Microsoft is also introducing its new Education Labs site today, which will focus on software and resources specifically for the education segment. According to Golden, Education Labs is being launched in an effort to bring tools for teachers and students to market more quickly. The new Moodle plugin is one of the first components in this new approach. "Education is changing quickly, and we have to be very responsive to how education works," Golden said. "We've spent a lot of time with customers; we've spent a lot of time with teachers, listening to their needs; and so we developed in a relatively short amount of time this plugin to take advantage of what they're doing in their classroom and support it and enhance it with our solutions at Live@edu." Along with the Moodle plugin, the Education Labs site will also initially include documentation and a roadmap that will, according to Golden, demonstrate how Microsoft wants "to be a very quick, short-cycle, responsive-to-market development house." To this end, Golden said, Education Labs has its own separate development team, with developers drawn from Microsoft's Education Group. "In much the way we're releasing this plugin, we want to be able to create features and addins and gadgets and other things that will help schools, students, and teachers immediately. And we don't want to go through some of the rigorous protocols and long development cycles that bog down the ability to help with specific needs in the marketplace. So we're doing a totally independent release mechanism for Education Labs in order to be able to support schools and the magic that happens between teachers and students every day." The free Moodle/Live@edu plugin is available for download now. Further information can be found on EducationLabs.com.